Speaking to troops deployed to the U.S.-Mexico border, Secretary of Defense Jim Mattis on Nov. 14 said that “in the Army, we don’t care if you’re male or female, we don’t care where you go to church or if you go to church. The Department of Defense estimated there will be more than 7,000 troops at various positions in Arizona, California and Texas as the migrant caravan approaches the border. “Nothing can shake you,” Mattis added. The Defense Department said the troops will assist with erecting barriers and helping the Department of Homeland Security and Customs and Border Protection (CBP) with other logistical tasks. Mattis said he does not expect the troops to come in direct contact with any of the migrants. Mattis also asked reporters to stop using military terms when writing on the border deployment. 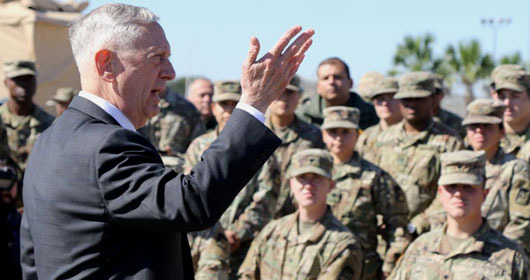 “This country may not be perfect, but you’re going to have to go a long way to find a country more willing to look itself in the eye and say we’ve got to improve here,” Mattis said to the troops.